406 mm/45 Mk54 х 2 pcs. Initial AP Shell Velocity768 m./s. 127 mm/25 Mk19 mod. 68 х 1 pcs. Initial HE Shell Velocity657 m./s. 20 mm Oerlikon Mk438 х 1 pcs.
. . . Firing Range4.2 km. 127 mm/51 Mk78 х 1 pcs. 20 mm Oerlikon Mk437 х 1 pcs. 40 mm Bofors Mk28 х 4 pcs. Colorado — American Tier VII battleship. She became the final phase in development of conventional battleships that featured very heavy armor protection for the vitally important parts of a ship. Key differences from her predecessors were her 406mm main guns and a novel torpedo protection system. In speed, she was outclassed by other battleships of her time. The very pinnacle of the American dreadnought and one of the Big Seven, Colorado is the last ship of this type you will experience within the US battleship line. While retaining the sluggish nature of the previous ships in the line, she has increased range and hitting power thanks to her 16in guns, as well as strong anti-aircraft armament. A massive departure of the other American super dreadnoughts New York, New Mexico, and Arizona, Colorado, behaves more like a close-in brawler, slowly closing the gap with other battleships, under the protection of her thick armor and sound torpedo bulge. However, her atrocious acceleration, low speed, and relatively low hit points require exceptional situational awareness, careful positioning, good damage control management, and constant movement (she should never slow to a full-stop). Furthermore, without a range modification installed, she must focus on closing distances with enemy cruisers and battleships to 14km or less, where her excellent guns are most effective at smashing them to bits. Recently, her WWI-era hull was removed, greatly aiding in the leveling-grind and boosting her range to the point where installing the Artillery Plotting Room upgrade will depend on one's play-style. Fitting her with the latter will boost her range to rival her contemporary, Nagato, but doing so will exclude maximizing either her secondary weapon or AA focused-build options. Colorado also received a buff to her hit points, putting her on par with her contemporaries at tier 7. Good gun characteristics: she has good damage and penetration on guns including over-matching all 25mm battleship hull armor, as well as a reasonably tight shell grouping, also reloads 4 seconds faster than New Mexico. Repair Party heals 0.65% of maximum hit points per second, compared to the standard 0.5% hit points per second, partially compensating for the lower health pool. Very low mobility: Feels even more sluggish compared to the New Mexico, also has atrocious acceleration without top engine, thus it is also very hard to stop and reverse while sailing her. 25mm plating everywhere vulnerable to HE spam and overmatch by 15in guns. Colorado is very slow. Therefore, researching the Engine upgrade is highly recommended. Afterwards, one should research Colorado (B) before the Gun Control Fire System upgrade, as any range increase provided by the latter is offset by the ship's lack of main gun accuracy at longer ranges. Additionally, Colorado (B) greatly increases ship stamina and AA defense, two assets Colorado must rely upon to compensate for other deficiencies. Despite her shortcomings, Colorado is a surprisingly modular ship which can be tailored to focus on main guns, secondaries, or AA. Slot 1 is most commonly filled with Main Armaments Modification 1 ( ), though Auxiliary Armaments Modification 1 ( ) is a popular pick for captains who go for a full AA build with other upgrades and commander skills. Slot 2 has one choice for battleships - Damage Control System Modification 1 ( ). This will reduce chances of fire and flood. Slot 3 offers several options. AA Guns Modification 1 ( ) will boost the outer AA envelope, while Secondary Battery Modification 2 ( ) will boost the range and accuracy of secondaries instead. Artillery Plotting Room Modification 1 ( ) will increase range and give secondaries a slight boost in range and accuracy, but may be a weaker choice than the other two. Slot 4 Steering Gears Modification 2 ( ) is recommended and will reduce rudder shift time. Captains with fire problems could also consider Damage Control System Modification 2 ( ), reducing the amount of time on fire and conserving hit points. Players can equip the following consumables on Colorado: ​Damage Control Party, Repair Party, and a choice between Spotting Aircraft and Catapult Fighter. It is strongly recommended to take the Premium versions of ​Damage Control Party and Repair Party to maximize surviveability. Given Colorado’s limited range, prioritising the Spotting Aircraft over the Catapult Fighter will often give more benefit to Colorado. 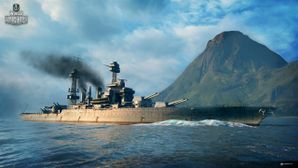 Players who wish to spend doubloons can equip Colorado with Type 17 camouflage that lowers her detection radius, reduces the accuracy of incoming shells, reduces her repair costs, increases her credit earnings, and increases the amount of experience she earns. The Colorado-class battleships were a group of four battleships built by the United States Navy after World War I. However, only three of the ships were completed: Colorado, Maryland, and West Virginia. The fourth, Washington, was over 75% completed when she was canceled under the terms of the Washington Naval Treaty in 1922. As such, the Colorado-class ships were the last and most powerful battleships built by the US Navy until the North Carolina class entered service on the eve of World War II. The Colorados were the final group of "standard" type battleships, designed to have similar speed and handling to simplify maneuvers with the line of battle. (The South Dakota class which was to follow would in several ways have been a departure from this practice.) Apart from an upgrade in striking power to eight 16-inch guns, the ships were essentially repeats of the earlier Tennessee class. The Colorados were also the last American capital ships built with four turrets and twin-mounted guns. The change to larger guns was prompted by the Japanese Nagato-class battleships, which also mounted eight 16-inch guns. 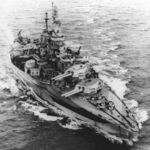 All three ships had extensive careers during World War II. Maryland and West Virginia were both present during the attack on Pearl Harbor on 7 December 1941, Colorado was at Puget Sound Naval Shipyard receiving an overhaul. Maryland escaped relatively unscathed; West Virginia was sunk in the shallow waters of the harbor but subsequently raised and repaired. All three ships served as artillery support ships during amphibious operations. Maryland and West Virginia were present at the last surface action between battleships, the Battle of Surigao Strait during the Battle of Leyte Gulf in October 1944. The three ships, put into the reserve fleet after the end of the war, were scrapped by the late 1950s. The Infobox image shows Colorado with her original Hull (A) which has since been removed from the game. Permanent camouflage resembles the Measure 32, Design 16D scheme, which is actually the historical camouflage of the Tennessee-class battleship (currently not in the game). Colorado was painted in Measure 31, Design 3D camouflage. Maryland’s Measure 31, Design 7D camouflage scheme is also missing. Both hull modules represent overhauls to the ship during World War II. Its spotting aircraft & catapult fighter, however, are in pre-war markings. Colorado’s propulsion was rated at 28,900 horsepower from the very beginning. There was no 27,000 horsepower downgrade. Hull (A) has six quadruple 1.1" (28 mm)/75 anti-aircraft guns which was unique to sister ship USS Maryland. Colorado was armed with only four quad 1.1" mounts and this was when she still had lattice masts; she had already re-equipped with 40mm Bofors guns when her lattice mainmast was cut down in November 1942. The eight quad 40mm Bofors guns on Hull (B) suggests that Colorado is in Spring 1944 condition. However, she carried two twin Bofors; the in-game model has three twin mounts. Colorado and Maryland had four twin Bofors mounts in total. Two were replaced by two quad Bofors when they were refitted in Spring 1944. Colorado steaming off New York City, circa 1932. Hull of Maryland under construction circa 1917. USS Maryland in March 1944. USS West Virginia in her final configuration, June 1944. Note 5"/38 twin turrets and number of AA guns; this configuration does not exist on the in-game Colorado. Illustration of the Colorado-class design, created in 1917. West Virginia in October 1935 off Hawaii. Maryland on 9 February 1942, little changed from her pre-war configuration. This page was last modified on 19 February 2019, at 05:29. This page has been accessed 85,514 times.